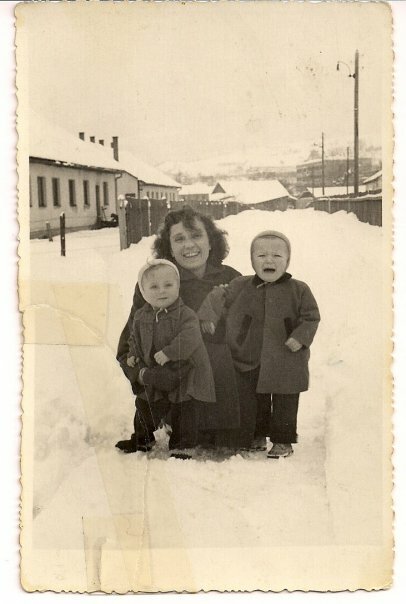 Veronika Sain, my baka (grandmother) was born in 1931 in Bosnia. Although her mother** had actually given birth to fifteen (yes 15!) children, only five of them had survived. I suppose that’s not surprising considering the era in which they were born. There are many stories I can tell you of my baka, but I’ve selected only a few. My baka is a devout Catholic (although she respects, and is friends with people of, different religions) who always told my sister and I to “do right by God”. She would pray every night before she went to sleep and encouraged us to do as well. I was not very interested in any religious practices but my baka is the one who introduced me to the concept of religion. One year around Christmas (or was it Easter? ), my baka had arranged for a priest to come over and bless the house. The expectation of my sister and I, as we were told the night before and reminded at breakfast that morning, was to kiss the priest’s hand when he gives us his blessing. I did not even understand what a priest does or who he is so you could say that I was less than enthused. The doorbell rang and this tall (he could have been short but I was young then so to me he was very tall) older man in a long dark dress (men wear dresses?!) walked in the house. He looked scary to me and I felt that if he got too close to anyone they would die a horrible death. He did some weird stuff with water and some type of lantern which released smoke (who carries fire with them?!) as he kept making air crosses with almost every step he took. (I was only 6 or 7 years old and this is what I remember thinking then.) I sat in a corner far away from anyplace he had to be and avoided my grandmother’s gaze because I was scared. The priest was done his blessing of the house and I knew that the time had come. My sister went first and I felt so bad for her. I didn’t want her to die a horrible death! As much as I tried to avoid the stares, everyone was looking at me with the expectation of approaching the man in the dark dress and kissing his hand. I started crying as my grandmother took me by the hand and led me towards the priest. I don’t remember how, but I got out of her strong grip, ran into the small pantry/closet and locked the door. I couldn’t kiss this man’s hand, I just couldn’t! When the coast was clear and I was sure that the priest was gone, I unlocked the door. I am sure I blocked out anything baka might have said to me although I did listen to the phone conversation she had with mama shortly after the priest left. Mama got an earful about how her children should know about and respect religious practices AND how we all need to go to church and pray. (Although I still do not practice any religion, baka taught me spirituality which I am grateful for.) My baka still prays for me every night and sends little icons of different saints to keep close for protection and blessings. For as long as I can remember, baka was a giver. She gave to those who didn’t have anything, to her siblings, to mama and to us, her grandkids. I remember this Muslim lady who lived across the street from baka and was one of baka’s regular coffee drinking companions, and probably one of her closest friends. (Coffee drinking is a very prompt, twice a day social gathering. The early morning round usually happened at baka’s and the afternoon at someone else’s home. This is how we knew who was cooking what for lunch or dinner, who has passed away, what is the best remedy for any illness, what is new in the neighborhood, the best crop to buy from what farmer that season etc.) Anytime that we were visiting baka, this lovely lady would make my favourite pumpkin or apple pita (a traditional Bosnian dish) and bring it over. No matter how long we were staying or how frequently we’ve come, she’d always come over and bring something. After we moved to Canada, our visits to baka’s were only a few before her friend passed, but during the last visit in 2006, I remember waking up from a nap to the smell of pumpkin pita. My grandpa (who was still alive then) and I inhaled it! You could tell that it was made with love! I went across the street to return the chef’s plate and to thank her, when I was given another gift – a small gold heart pendant. I knew she didn’t have very much money so I asked her “What is this for? You don’t have to give me anything.” She said “I give you this because your grandmother always gave to me. When I had nothing, she’d offer whatever she had so that my kids were not affected. Anytime I was down, your grandmother offered her support and her friendship. But she didn’t do that just for me, she did that for everyone. Whomever she could help, she did. I know how much she loves you and this is a small way for me to show my appreciation to her by giving something to you.” Anytime I give or help someone, I think of baka and know that I’m adding to her legacy of selflessness. *Baka’s father was an office worker who loved to drink and spent a lot of his pay on alcohol. He wasn’t a very happy drunk either and he expected everyone to cater to him. **Baka’s mother was a housewife. She was an excellent seamstress and a flute player. She also took in, and took care of her grandchildren when her children couldn’t. (My mama holds very fond and warm memories of her grandmother.) I never knew her as she passed away before I was born. This entry was posted on Wednesday, June 1st, 2011 at 2:29 am	and tagged with Grandmother, Strength, Strong Women and posted in Family, Strength of women, Uncategorized. You can follow any responses to this entry through the RSS 2.0 feed.